Todd Hollowell is as comfortable with a studio microphone as he is on a fishing boat. The Fishers professional fisherman has joined the Fishing League Worldwide Tour as a color studio analyst for “FLW Live” for 2019. When he chose not to compete in the FLW Tour this year, FLW Live producer Peyote Perryman contacted Hollowell about joining the telecast. “It’s the perfect mix of what FLW viewers want, which is someone who has extensive experience and success on the water and can also communicate to the viewer what is actually happening,” Hollowell said. Hollowell was invited to join the broadcast after he chose not to fish on the FLW Tour this year. 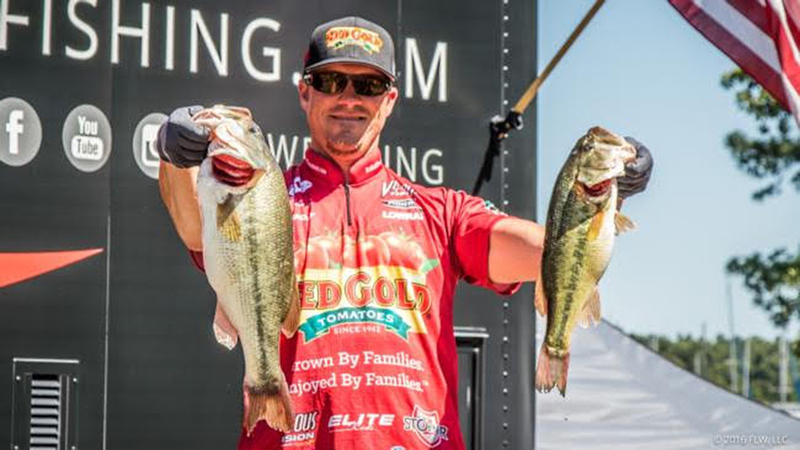 Sponsored by Red Gold Tomatoes since 2012, Hollowell will fish four events on the shorter Costa FLW Tour. His first event is in Branson, Mo. in April. The FTW Tour features eight events, with the final one being a championship. “FLW Live” is telecast on NBC Sports Network. The first event concluded Jan. 13 in Texas. The next one is Feb. 7-10 in Florida. Hollowell, who has lived in Fishers for 15 years, is an agent for Ray Insurance Group in Fishers. It is approximately a five-hour drive for Hollowell to the studio in Benton, Ky.
“I drive down there Friday night and I’m home Sunday night,” he said. Hollowell, 42, grew up in Anderson and learned to fish on Geist Reservoir. Hollowell and his wife, Rebecca, have two sons, Hunter, an eighth-grader at Fishers Jr. High, and Hayden, a sixth-grader at Sand Creek Intermediate.